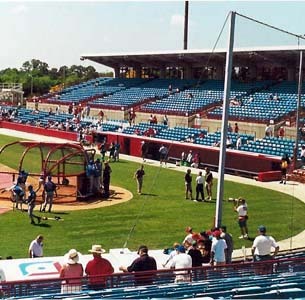 Ed Smith Stadium in Sarasota is very similar to the Phillies' stadium in Clearwater. 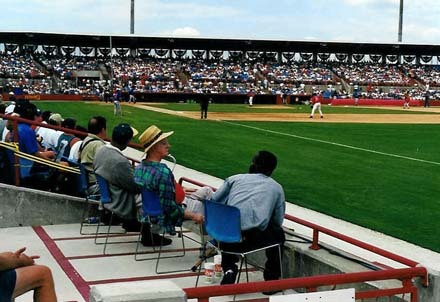 One of the great things about Ed Smith that I love is that it is large enough to hold an adequate number of fans, but it isn't colossal like Legends Field or the Wide World of Sports, so the spring training ambiance isn't lost. I would consider all of the seats to have a good view, with the best being right behind home plate on the second level. I recommend getting a seat with shade in the upper deck though because the games can get quite hot. Ed Smith is a great place to get autographs, but don't get too hopeful about getting Griffey's. When I went, the rumor going around was that the only time Griffey signed was during the first game. Like the Royals and Indians, the Reds facility has a number of minor leaue fields for practice. The food at Ed Smith Stadum was adequate, but it didn't have any real specialties; however Little Caesar's Pizza was available. One thing that has taken away from my experienes here is that the men's toilets were overflowing and closed. Once, I can understand, but when I went a year later the exact same thing happened! I'm sure this probably isn't common, but it was a disappointment. This is a great place to take a family to see a game; there's always lots of kids here, especially hanging around the right field wall to get autographs as the players leave. Ed Smith is a fabulous place to see a game, and when there, you will truly feel like you're seeing an actual minor league game. You may want to go here to view interactive panoramic images of the stadium so you can make your own judgement. Most fans wait along the dugouts before and after the game for autographs. It can get pretty crowded here, even if it is well before game time. Here is a good view from the uppper level of the stadium from the third base line. You can get a good feel for the cozy size of the stadium from this shot. Ed Smith is unique in that almost any seat is fantastic and a great place to see a ball game. 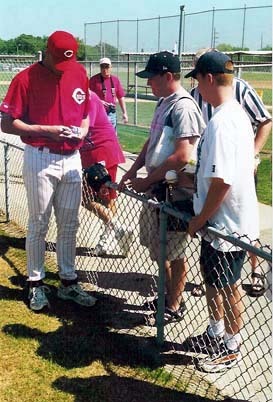 This is a picture from the Reds' minor league practice field (see autograph tip below). These areas are open throughout the duration of the main game and there is rarely a line to get autographs. This is a view from the very end of the bleacher seats on the right field line. Next to where this picture was taken from is an area where fans like to wait for autographs, next to where the players enter the stadium. Autograph tip: The Reds' complex has an extensive minor league facility in addition to the main stadium. 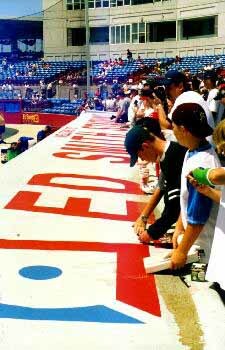 Instead of competing with hundreds of other fans for autographs inside the stadium, go to the minor league area and get autographs of upcoming stars without having to push your way through other fans. I got Adam Dunn's signature before he reached the bigs this way.